This weeks longer route is courtesy of Sarah. Distance 62.6 mile, with 4,816ft of climbing. The route heads out to Abergele, up through Betws Yn Rhos – before climing up to the top of Black Cat hill, before heading south to join at the top of Llanrwst and the descent into Llanrwst. Heading then over the bridge, to head up the West side to Conwy and back along the front to Abergele. 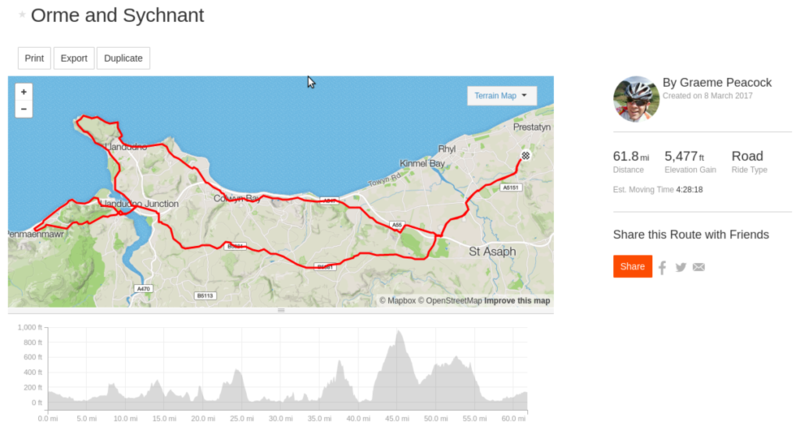 This route is published to Strava, and available for download as TCX and GPX.